Miguel Rivera (Anthony Gonzalez), 12, lives in a Mexican village. He comes from a long line of shoemakers who hate music because decades earlier, Miguel’s great-great-grandfather abandoned his wife Imelda and their children in order to follow his dream of becoming a famous performer. The boy hates the idea of becoming a shoemaker. Instead, he idolizes late movie star/musician Ernesto de la Cruz (Benjamin Bratt) and wants to be a musician, like his idol. 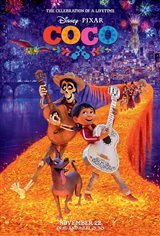 While trying to borrow a guitar so he can enter a talent competition, Miguel discovers an link between himself and Ernesto and accidentally enters the Land of the Dead. There, along with his stray dog, Dante, he meets his ancestors, whose photos have been placed on a table in Miguel's family home so that their souls can return to the living for a day. Miguel, who wants to earn his family’s blessing to play music — discovers a family secret and is desperate to return to the Land of the Living — but that may not be as easy as he thought.